Original source code written in 2016 by Olivier Zardini and Antoine Vignau to test and support the 4soniq card by Manila Gear. The 4soniq card is a quadri/octo-phonic card for the Apple IIgs. It brings great enhancements to the Apple IIgs sound capabilities. We like that card and we support it. 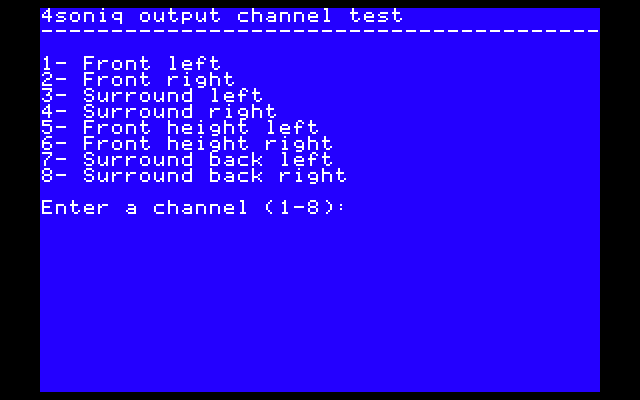 Boot the diskette, launch it from the Finder, press a key 1-8 to output a digitized voice to the right output channel. Either press 0 or return to leave the program. The source code is included in the DATA folder. It is written in Merlin and has enough comments for you to understand how to program the Sound toolset of the Apple IIgs to output your sounds to any of the eight available channels.